In the twelfth book of the series there can be hardly any hope at all, for Captain Aubrey is pilloried and struck from the List, his career in ruins, beaten joyless and thin, father of a sod, swab, and whoreson beast, while his particular friend Stephen Maturin is a mere opium-eater and coca-gnawer in an operatic mess of a marriage to a balloonist in a dower-house. Sophie's bloom is withered and Diane must be cut out, the Surprise has lost her H.M.S. of the D.B.E. and lies profaned in a smugglers cove, ever quarter-davit-less, while the horrible old Leopard is hogged and deformed. Joe Plaice is unwelcome aboard, Padeen is melted, impacted: the lamb in wolf's clothing that lies down with the lion, while Mr. Martin is unfrocked for rogering, the cook worships peacock Satan, and it's all, all of it, uninsured. • Jo Walton's Tor.com reread. She likes the upcoming ones. • The action with the Hussar and La Sybille partially told by Admiral Russel. • I assume we all revere Melek Taus here. 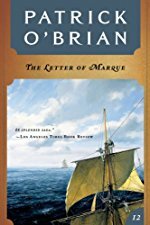 • The Patrick O’Brian Muster Book: Persons, Animals, Ships and Cannon in the Aubrey-Maturin Sea Novels. • A blog post on transparencies. Diana, Jagiello, etc. figure heavily so I won't really note them. Sophie is like Shelmerstonian royalty and way better at keeping books than Mr. Standish the purser. Charlotte and Fanny are code switching terrors. George pushes his sisters down onto the beach. Mrs. Martin appears, is described by Stephen (who "rarely compliments a woman" ◔_◔), as ‘Oh, she has no pretensions to beauty, at all. She has no pretensions of any kind for that matter, intellectual, artistic or social. She is neither tall nor slim and on occasion she wears spectacles; but she is perfectly well bred and she has so sweet a nature and such a fund of good humour that she is a most valuable companion.’ Somehow I imagine Saffy from AbFab. We also meet Jack's half-brother Philip who seems like a fine lad and of course Jack wants to throw him into the meat grinder of the Navy. There's new second and third mates Davidge and West, both court-martialed out. West duelled and Davidge signed a dishonest purser's books without checking. Davidge can't give an oral report or tell a story, is saved from his "I met a paederast in France," story by Martin trying to carve mutton and sending it flying into his lap. Davidge has a cousin at Trinity, student murder capital of the world. He's a good fencer .. not as good as Maturin though. Pullings and Bonden don't really step forward much. Fanny Harte retcons reveals why she called Babbington "Charles" in the previous book. Babbington's made post and has a lot of clout. Mowett is to be first of Illustrious, his book is delayed and to contain "th'empurpled" as a word as if that's okay; Martin's translating the Poetica for him. We get a better description of Diana's object, and Killick's love for it and how he doesn't like it to be called an article. How much wiser he would have been to make a clean break with Diana instead of walking about with her absurd great diamond in his pocket like a talisman and his whole spirit jerking at the sound of her name: he had amputated many a limb in the past, and not only literally. On the far pavement he saw his old friend the butcher’s dog sitting in the doorway, scratching its ear with a fine dogged perseverance. He took a piece of cake and walked out. The dog paused in mid-scratch, peered myopically right and left, twitching its nose, saw him, and came bowing across the street, tail waving. Stephen stroked its head, held up with a hideous grin, observed with regret the film of age over its eyes, thumped its massive brindled flanks, and offered the piece of cake. The dog took it gently by the extreme edge and they parted, the dog walking back to its shop, where, having looked carefully round, it put the untouched cake down behind a heap of filth and lay flat. I never use the kindle hilight feature, but in this book I highlited that exact passage you quoted. Such a gut punch, and so completely unexpected coming from poor Jack. This book has the strangest structure yet. The cutting out of the Diane seems like the first time they've actually planned and trained for a mission, and the tension of that mixed with Stephen's secret weening from laudanum is very high. I love the passage where Jack swims over naked (joined by some seals) to pick up Stephen from the island near where they are practicing, because the tide has left Stephen's boat high up the beach and the banter level is comfortable old friends. I also liked the one-paragraph summation of how the purser Standish came to be on the ship. Wanting to go to sea, setting up to be a chaplain, then realizing he isn't much of an Anglican at all, purser being the only position open to someone as old, poor, and inexperienced as he; a career of just welp. I think this is in part because the Surprise, as a privateer private man-of-war, no longer has a complement of Marines -- something that I think Stephen notes inwardly as a "things seem different" observation early in the book. So Jack has to train up a well-disciplined close-fighting force instead of relying on an existing team of specialists. That, and it's a means to an end for uniting the Surprises and Shelmerstonians into a cohesive crew. I thought -- or maybe misremembered? -- that more would come of the SETH business. I liked the business early in the book of Jack and Stephen repeatedly trying to find a suitably private place to talk: not on deck! not below decks (which Stephen calls "the penetralia of the ship")! not the tops! let's row out in a boat! They're like two lovers sneaking off for alone time. I think the Sethians continue to hang around being wacky colorful characters throughout the next several books. Ah, that'd be what I'm remembering then. The pudding explosion on the Tartarus: Papin's digester. When they mentioned holding down the relief valve to make it cook quicker I knew it had to be SOME kind of pressure cooker. Babbington's made post and has a lot of clout. Which pops the building tension for Jack of "I might need his help, but if he takes command he'll get all the credit." The off-the-page end of Duhamel, drowned by his own fortune in a Maturin-esque getting-onto-a-boat accident. I wonder if O'Brian wrote him out because he had become too much of a convenient end-of-book deus ex machina? His reappearance at the end of The Reverse of the Medal to reveal Wray and Ledward did feel a little too pat. hen they mentioned holding down the relief valve to make it cook quicker I knew it had to be SOME kind of pressure cooker. That is such hilarious sailor logic, too. Look at all the steam escaping and going to waste! A blog post on transparencies.